Above: Click map to enlarge. 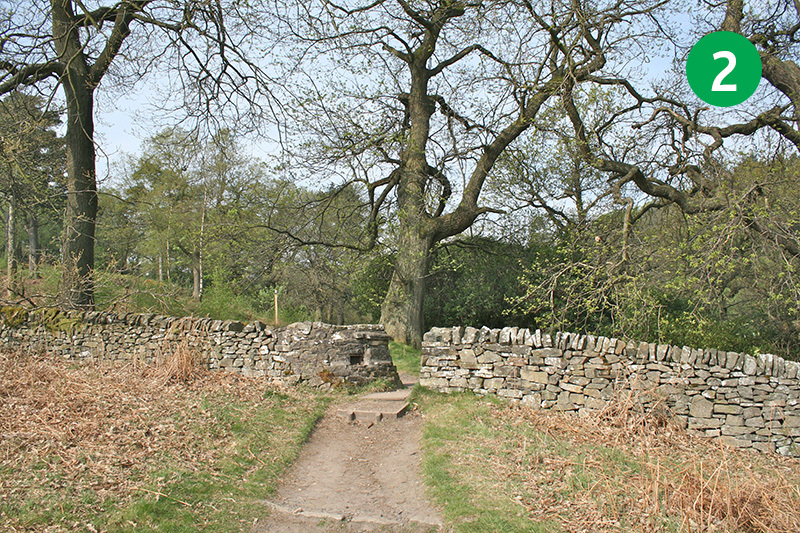 I’ve included some old photographs of Errwood Hall in this latest walk video, taken in late April. 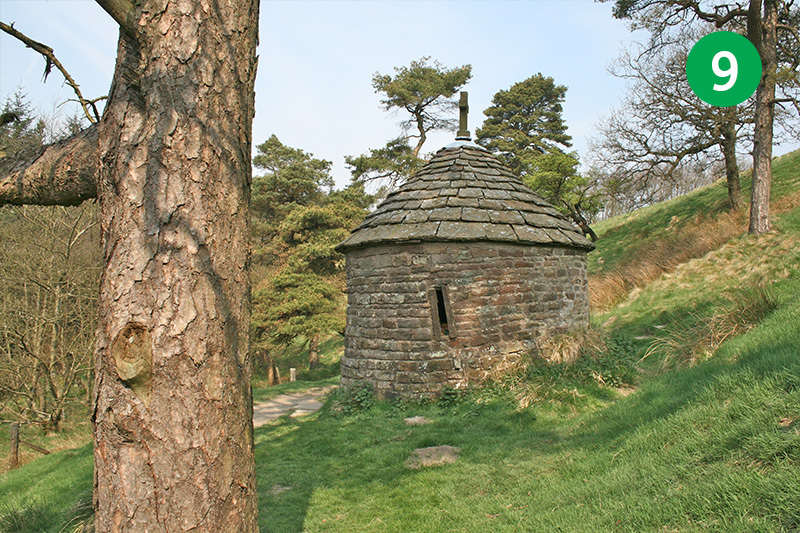 It reaches as far as the small, circular St Joseph’s Shrine, before returning along Foxlow Edge. (Click here for more information on the shrine.) About 3 miles long, there are some wonderful views to enjoy from the top of Foxlow Edge – at least there would have been, if it hadn’t been quite so hazy! 1: The starting point is Errwood Hall car park, beside Errwood Reservoir. If the road is closed – which it is on bank holidays and Sundays from May to September – park at one of the other car parks on either side of the dam wall, and walk along the road to reach the starting point. 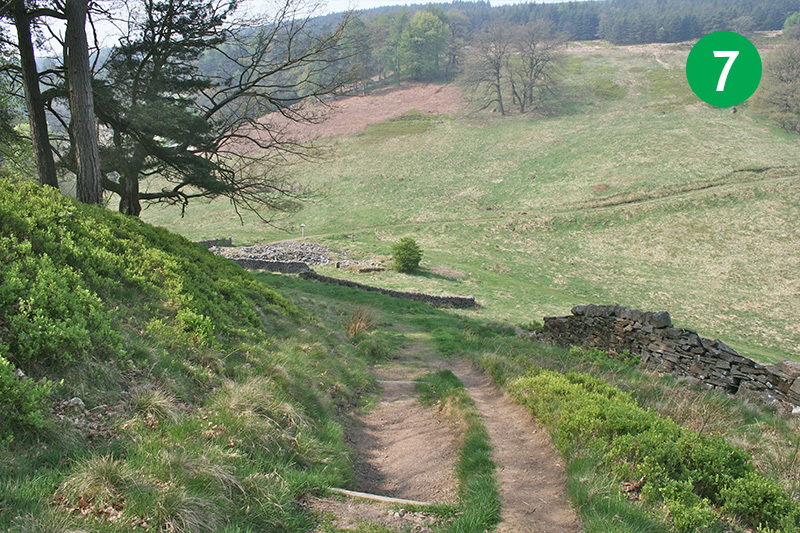 3: Keep going as the path slopes upwards, then turn right at the footpath sign towards the ruins of Errwood Hall. There’s lots of information on the website about the hall and the family that once lived here. 4: It’s still possible to make out the faint traces of the ornamental garden with its central fountain which lay beyond the stone arches and doorway. 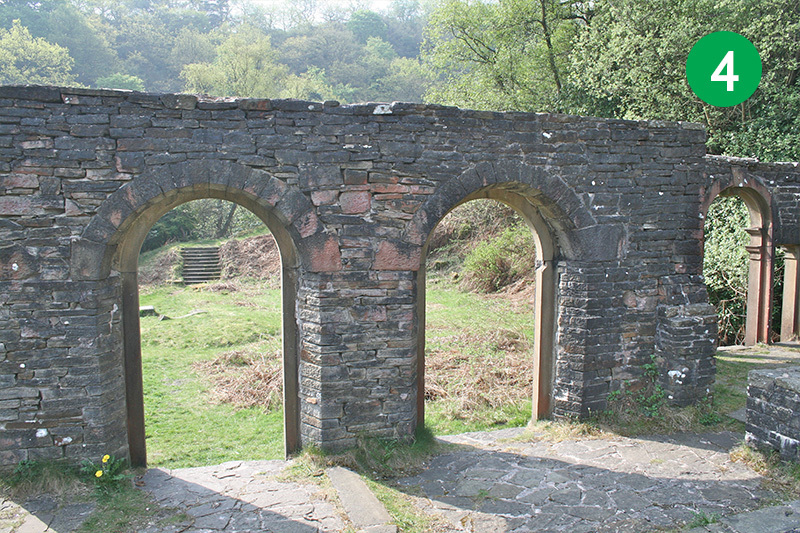 At the far end is a series of stone steps which once formed part of an impressive archway. Head up these steps. 5: Look out for some stone steps on the right. 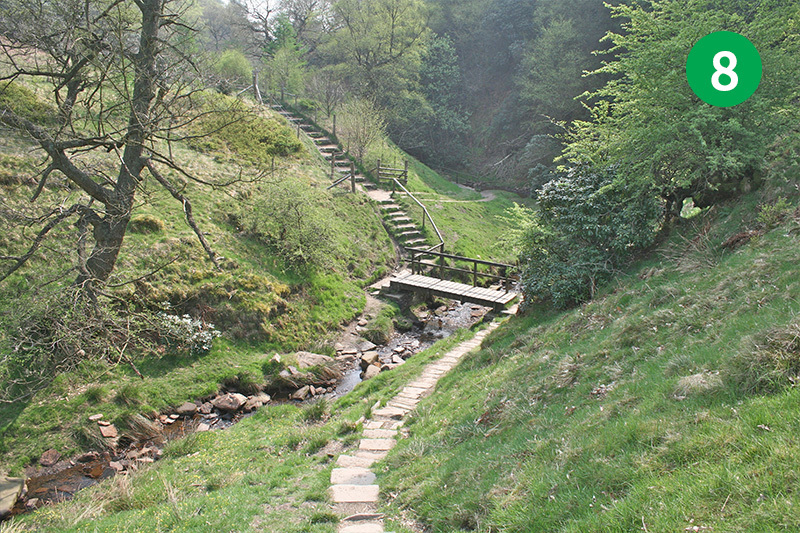 The accompanying video shows the walk going up these steps and the left along the side of the valley. But this path can get muddy and overgrown. So you may prefer to simply follow the path straight ahead – as shown on the map. 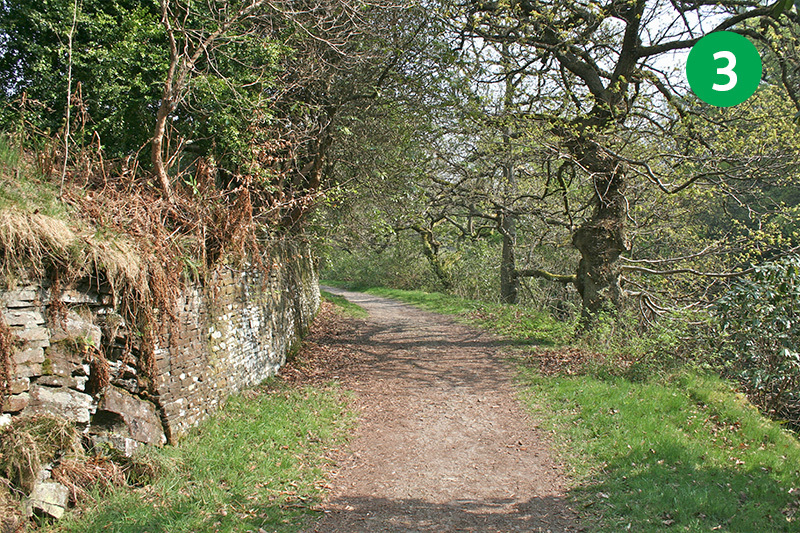 Both paths exit near the ruins of Castedge Farmhouse. 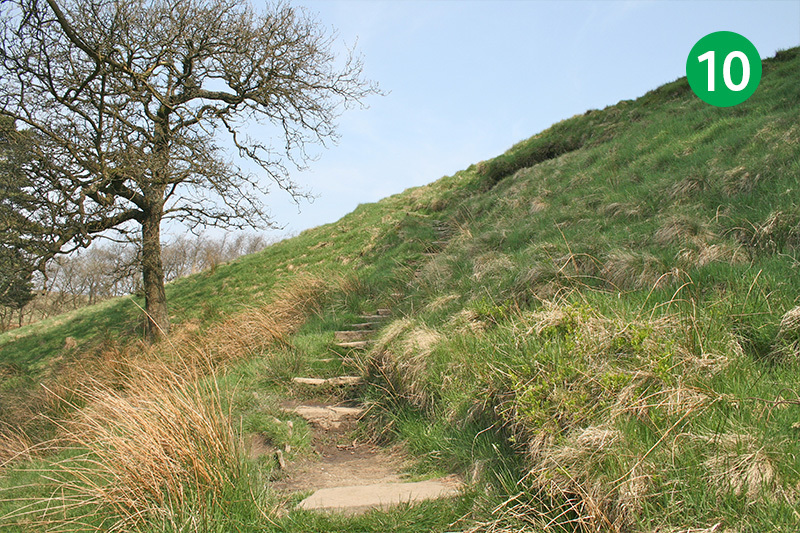 6: To view the hilltop graves of the Grimshawe family, take the path which winds up the side of the slope behind the farmhouse ruins. 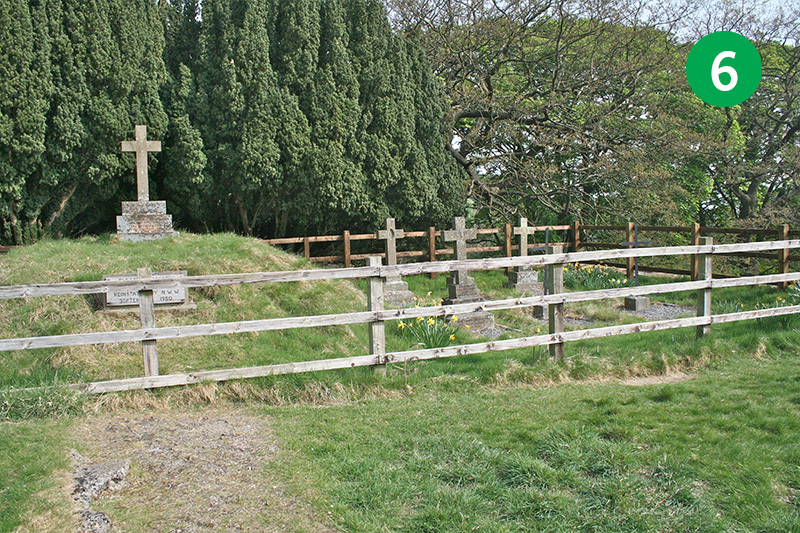 Again, there’s lots of information on the website about both the graves and Castedge Farmhouse. 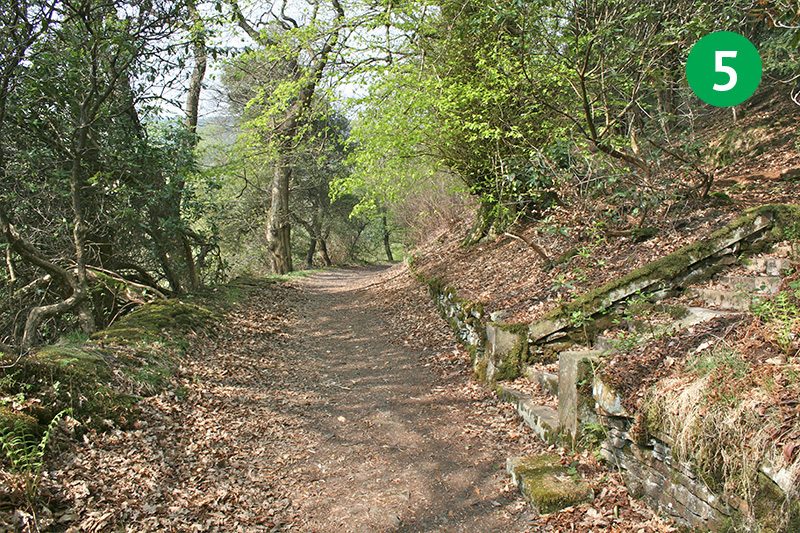 7: Follow the same path back down until you can turn right down the slope, through a gap in the stone wall, and turn right again along the footpath. 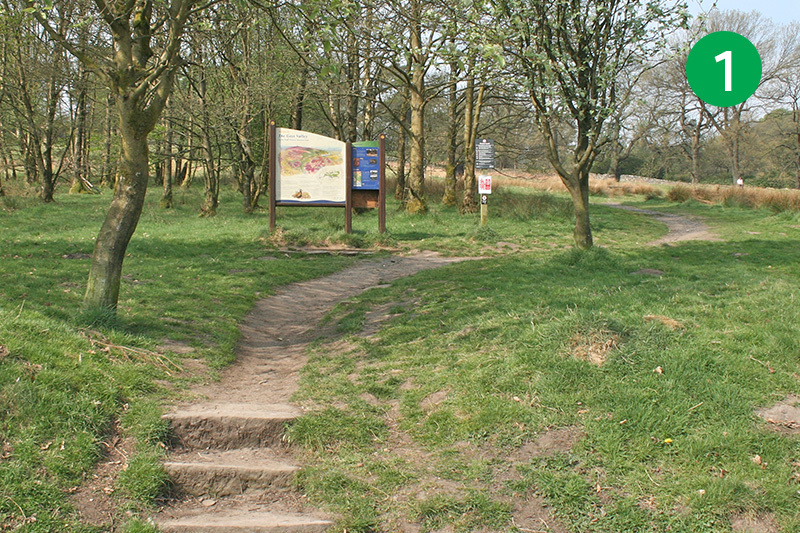 8: Go over the footbridge, up the other side, and turn left along the narrow footpath, following the sign to Pym Chair. 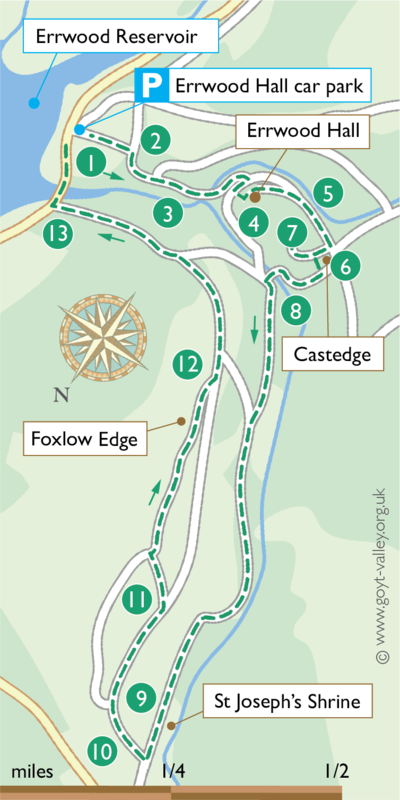 9: Follow this footpath along the side of the valley for about 3/4 mile. Eventually you will see the small circular stone building down on your left which is known as St Joseph’s Shrine. Again, there’s lots of information on the website about the history of this shrine. It’s a wonderful place to rest a while and enjoy the peaceful surroundings. 10: Go up the steps at the back of the shrine and continue left along the same path. After a short distance take the path which heads up the slope to your right. This leads along Follow Edge which offers some of the best panoramic views over both sides of the valley. 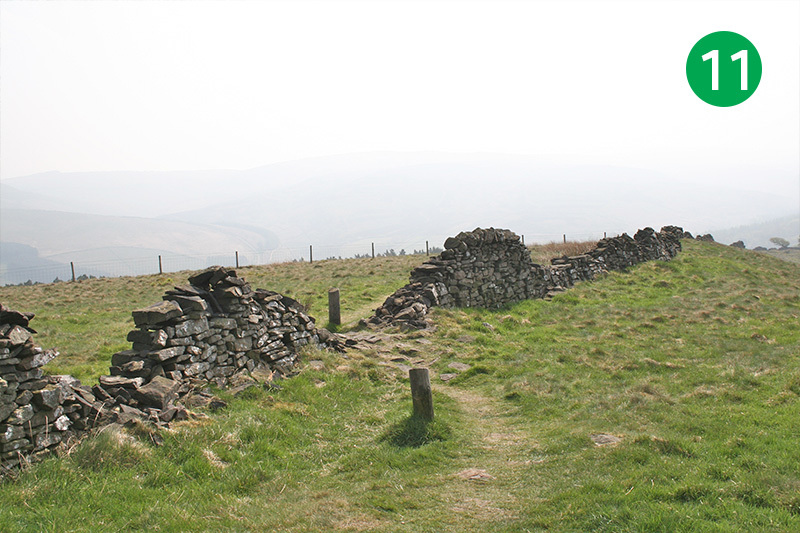 11: Follow this path as it leads along the ridge, and go through a gap in the stone wall on your left as you reach the summit. 12: Follow the path between the wall on your right and fencing on your left. 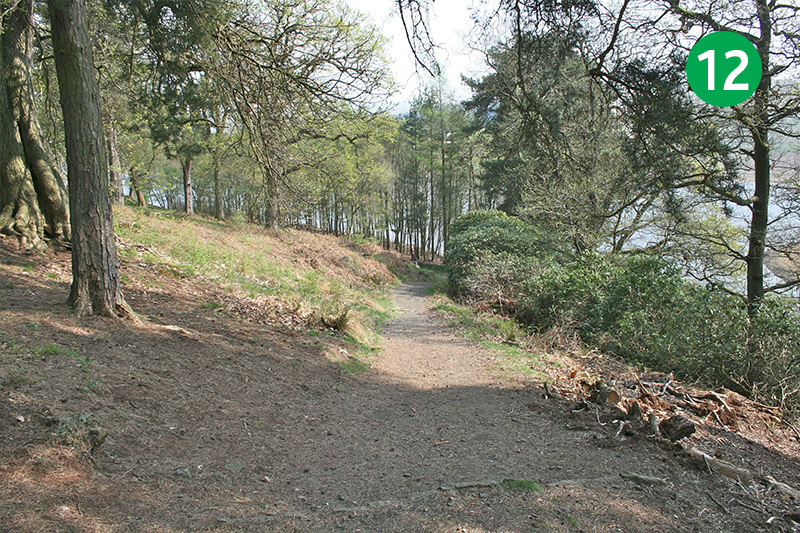 This leads all the way back to the small road alongside the reservoir. 13. Turn right to return to Errwood Hall car park. As you cross the modern bridge, take a look up the stream to your right. 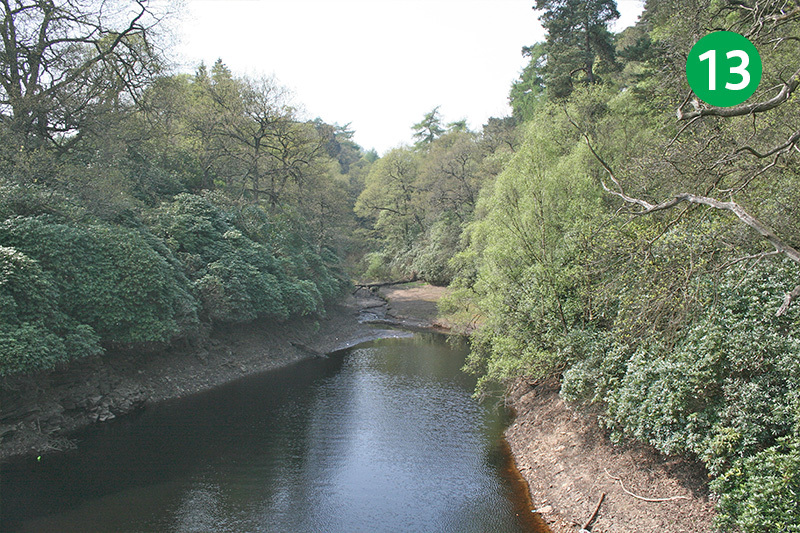 The entrance drive to Errwood Hall once ran alongside the stream, and you can sometimes see it when the water level is low.